Ian Moore of Michael Moore Car Sales, Athlone, pictured with the stylish new Mercedes-Benz A-Class. 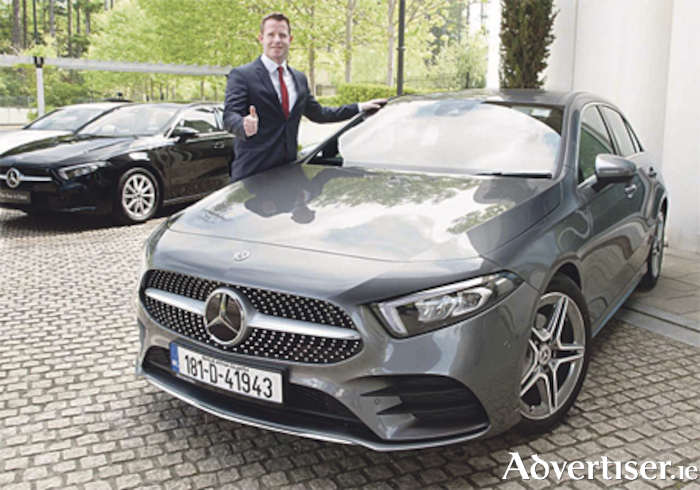 Ian Moore of Michael Moore Car Sales, Athlone, has welcomed the arrival of the stylish new Mercedes-Benz A-Class, the first versions of which have arrived in Ireland. Initially launched on the market are the A180d Automatic priced at €31,530 and an A200 petrol priced at €34,235 with an entry level A160 petrol and A160d to follow at prices likely to be in the €30,000 region. Launched alongside the new, four-door CLS Coupé, the A-Class is larger than its predecessor. Aimed at a younger generation of motorists, its high-tech features include an ultra-modern multimedia and infotainment system with touch-screen operation and artificial intelligence that helps it memorise driver instructions and preferences.